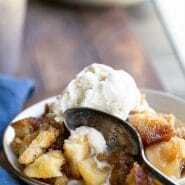 Classic Brown Betty recipe – a pan of juicy apples layered with sweet, buttery toasted bread. Delicious alternative to apple crisp! Published 10/25/12. Updated with new photos and tips 10/4/18. Apple Brown Betty is sort of like apple crisp’s less famous cousin. It’s a warm, homey dessert made with everyday pantry staples. Since it uses apples, it’s also a perfect Fall desert. 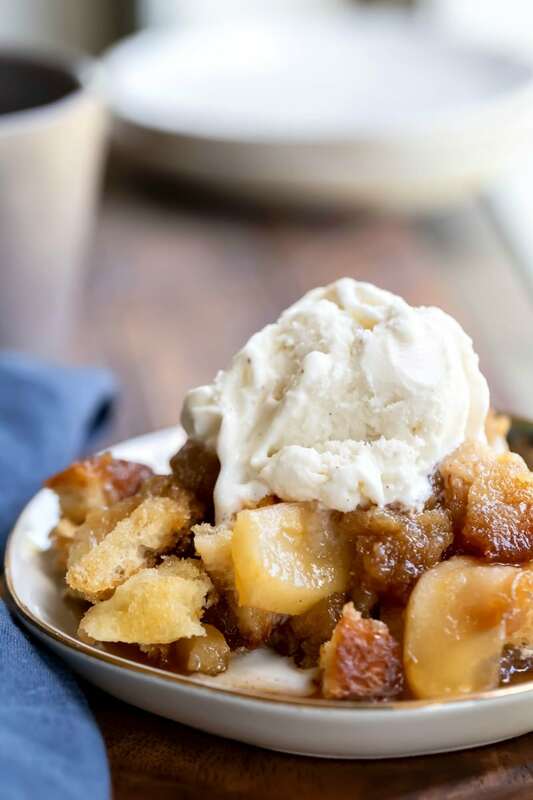 What is Apple Brown Betty? 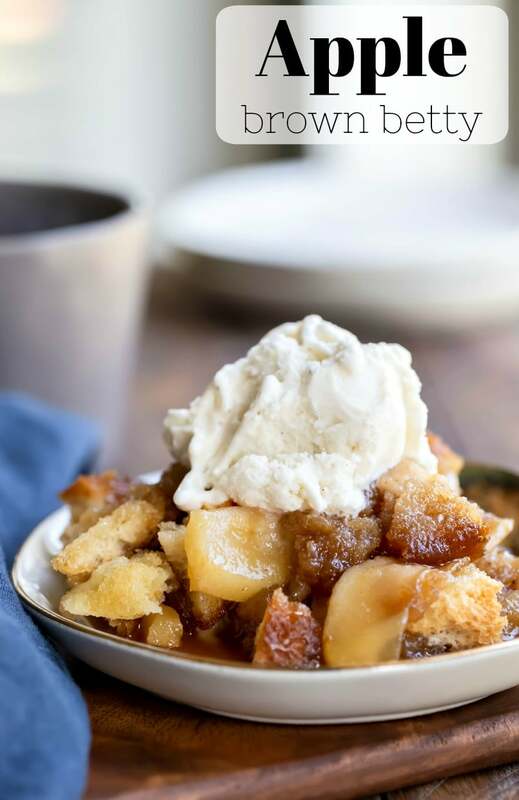 Apple Brown Betty is very simple – tart apples layered with brown sugar and bread. It’s a baked apple dessert that’s similar to apple crisp. Rather than a crisp topping, the apples are layered with a sweetend bread crumb mixture. 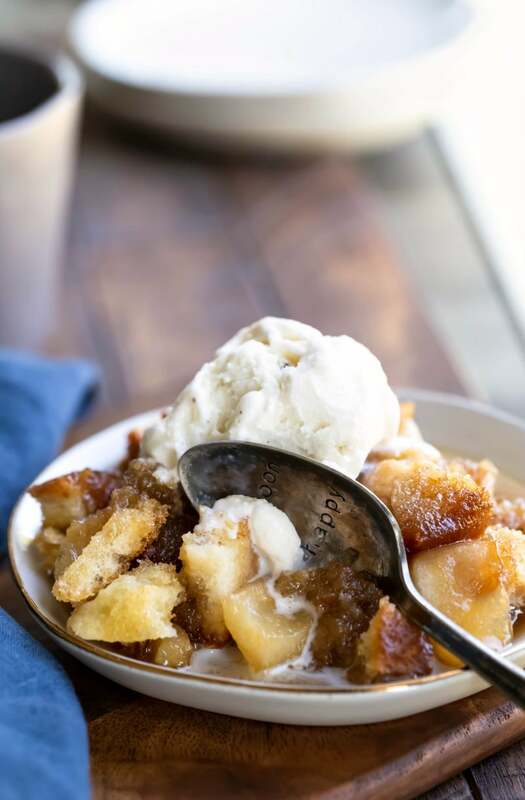 Apple Brown Betty is made by layering brown sugar, sliced apples, fresh bread crumbs, and spices. It’s topped with a layer of butter pats and brown sugar. Then, it’s covered with foil and baked until the apples are tender. I unwrap the foil and let the top crisp up a little before serving. This dessert is delicious as-is. If you want prefer, you can serve it with vanilla ice cream or sweetened whipped cream on top. If you’ve tried this, don’t forget to Apple Brown Betty the recipe and leave me a comment below. I love to hear from people who’ve made my recipes! You can SUBSCRIBE to receive my latest recipe newsletters or FOLLOW ME on FACEBOOK, INSTAGRAM and PINTEREST for even more delicious food. Coat a 7x11-inch baking dish with butter. Add 1/4 cup brown sugar, 1/2 of the apple slices, and 1/2 of the breadcrumbs to the dish. Sprinkle with cinnamon, ginger, and nutmeg. Slice butter and lay slices all over the top of the breadcrumbs. Sprinkle dish with remaining 1/4 cup brown sugar. Bake, covered in foil, until done – about 30-40 minutes. Carefully remove foil in last few minutes of baking to brown the top. *If you use Granny Smith apples, you may want to increase the sugar by 1/4 cup if you like desserts on the sweeter side. This is a wonderful recipe! I’ve been making it for years. Thanks for sharing!